“HorrorShow” team, who must pass through nine “circuses” on California Island, and defeat the megacorporation, SPORT, to win the trillion-dollar prize. The team is a spangled banner of races, skills and troubled pasts: a gay Hispanic gymnast, a native-American stunt coordinator, an Aborigine swimmer, a genetically engineered “fiteball quarrelback,” a Bosnian movie star and entrepreneur, a Japanese-American courtesan and assassin, an African-American “bizzyball” player and terrorist’s daughter. Three are killers; three blame themselves for deaths. One aborted her child. Another watched his lover waste away with retroviruses. The team must contend with: radioactive dumps, deserts, boiling lakes, high velocity winds, hot-headed centaurs out of David Mamet, equine aliens with British accents, homunculi bikers, mutant hairdressers, clumsy Ninjas, talk show hosts in tanks, and distortion fields that carry them through space and time. The novel is a particle accelerator full of tropes, pastiches, parodies, songs, commercials, miniplays, sound bites, neologisms, wordplay, scriptural parodies, movie promos, maps, charts and sports. Even if you don’t read science-fiction, it might cheer you up. 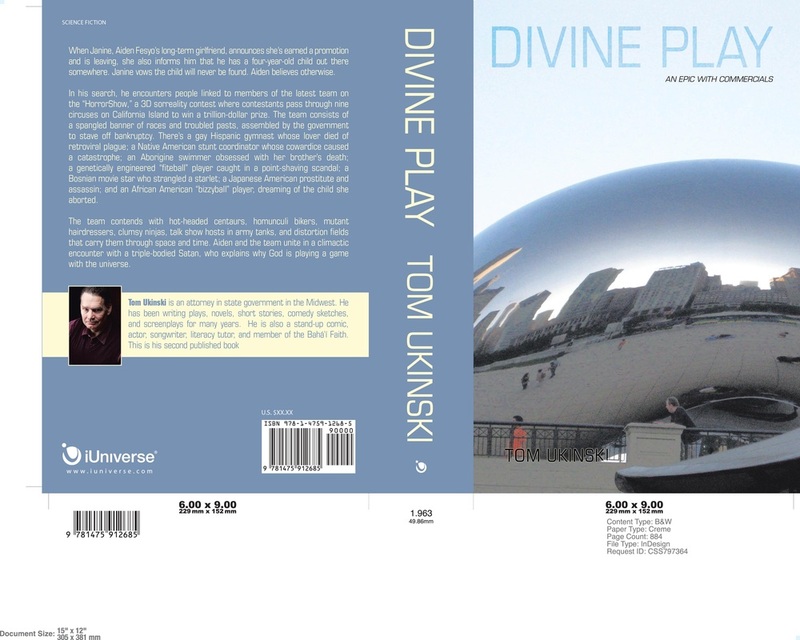 The final title is Divine Play: An Epic with Commercials. added an enormous amount of depth, but, hopefully retained the satire. Although many authors casually refer to “Dante’s Inferno” or the “ninth circle of hell,” I went through the Inferno in detail, adopting its methodology of correlating sin with consequence, but modernizing the punishments (and, of course, societal context). Last Job on Earth (1993). The actors I think of would be too old for the roles. I suspect the characters would be portrayed primarily by unknowns. Divine Play is an exploration into the consciousness of seven contestants in a “sorreality” show based on Dante’s Inferno who represent a spangled banner of races, skills and troubled pasts. This story is intertwined with that of an everyman searching for a child he never knew existed. Discounting work on other projects and the intrusions of life, fifteen years. Kurt Vonnegut (esp. Slaughterhouse Five and Sirens of Titan). I liked science fiction that created its own vocabulary and incorporated other languages (even artificial ones), portrayed a story from multiple viewpoints (for example, Divine Play has a chapter narrated by the Earth), and went beyond the superficial characterizations in most sci-fi (and most popular fiction). I wanted to write a humorous “epic” that utilized multiple forms of media (albeit reduced to print), and also combined literature with sports (however bizarre my versions of the sports). Since sci-fi magazine publishers regularly provide lists of topics that they do not want to see, I made sure that I included them with every other that sci-fi category I could think of. The narrative is interspersed with tropes, pastiches, songs, commercials, mini-plays, sound bites, neologisms, wordplay, scriptural parodies, movie promos, maps, charts and satire of everything. It also includes a vocabulary, index of characters, and 3DTV guide. It is one of the few novels with footnotes.